This week, eighteen thousand people traveled to Washington DC for the American Israel Public Affairs Committee’s 2019 policy conference. Having made it to the top three schools in the Adam and Gila Milstein innovation competition, I and fifteen of my peers from Tanenbaum CHAT high school in Toronto flew to Washington as well. The Innovation contest called for schools across North America to create an idea that, with the $16,000 grant awarded to the victor, would be an effective tool to create a pro Israel atmosphere on college campuses. Our idea was an initiative called “Shuk Shelanu” (Our market). A mini Machane Yehuda on campus, consisting of eight unique booths to capture the essence of Jerusalem’s Shuk Machane Yehudah, filled with products chosen to represent the multiculturalism of the Middle East. In addition to the booths, Israeli music would be played along with an area designed for students and staff to participate in classic Israeli games like shesh besh (backgammon) and matkot (paddle ball). We chose this idea because we believe that the most effective way to advocate for Israel is to illustrate Her role as a mosaic of multiculturalism and as a bridge that connects people with different ethnic, religious, and political backgrounds. Even though our team did not win the competition and receive the money to make “Shuk Shelanu” a reality, the AIPAC experience for me was second to none. The purpose of AIPAC is to gather pro Israel Americans to a conference featuring some of the biggest names in politics from both sides of the aisle. It is the one time of year where the left and right both show up to stand for Israel. At the conference I had the opportunity to hear from Prime Minister Netanyahu and other supporters of Israel like Vice President Mike Pence, Israeli general Binyamin Gantz, senior United States Senator Charles Schumer, Secretary of State Mike Pompeo, political historian Gil Troy, former American ambassador to the UN Nikki Haley, Likud party member Amir Ohana, Ambassador to Israel David Friedman, Congressman Dan Crenshaw, Senator Robert Menendez, House Speaker Nancy Pelosi, Ambassador Ron Dermer, Mayor Bill De Blasio and many more. As you can probably tell, the speakers I listed vary in their politics, but their political views are not what I would like to address in this article. What impressed me at AIPAC was not the diverse politicians on the stage, but the sea of purple in the audience. Healthy democracies must have policies that both the left and the right can agree on. This was on full display at AIPAC as attendees from all political parties stood together in their support of Israel and pro Israel policies. Over the course of the weekend I made many trips between the convention centre and the Starbucks five minutes away. On those quests for caffeine, I encountered everyday Jewish and non Jewish North Americans who hold the State of Israel close to their hearts. Not only did this lead to some fascinating moments of Jewish geography, but it also led to meaningful conversations with complete strangers about our shared love for Israel. This is why support for Israel must be bipartisan. Israel needs bipartisan support in order to ensure that the Jewish people are working with each other rather than fighting each other. With the deep polarization of the American and Canadian publics, common ground between parties is becoming increasingly rare to the point where people care less about the particular policy, and more about which political party the policy comes from. In her speech at AIPAC, former ambassador to the UN Nikki Haley expressed that “the political atmosphere right now is so toxic. It’s so toxic… because if you put a good piece of legislation on the table, everybody wants to know whose it is first, before they decide whether to support it. That’s wrong.” While partisan viewpoints are a reality in our society and allow for vigorous debate that can strengthen our democracy, having support for Israel become a partisan issue hurts the only democracy in the Middle East and one of the prime innovators in the world. When they tell us to step back: We move forward! When they try to silence us: We speak up! When they tell us to sit down: We stand up! Seventy one years ago, Israel was created to be a shelter for an oppressed people. Now, and in 1948, Israel is the key to the survival of the Jewish people. If this dreadful trend continues where Jews across the world let their partisan beliefs cause divisions in the community; we may lose the very elixir we need to survive. Israel. The day where Jews begin to let their opinions on Israel harm their relationships with others, and the day we let our own views triumph over וְאָהַבְתָּ לְרֵעֲךָ כָּמוֹךָ is the day we know that we have lost. But we have not lost yet. The fact that eighteen thousand Jews with different political views came together to support Israel gives me hope. The fact that Israel is so young and has lots of time to learn and grow gives me hope. And the fact that Israel continues to innovate and in a few weeks will land on the moon gives me hope. Growing up in the era of social media led me to believe that people were too far apart to agree on anything. Attending AIPAC taught me that in our support for Israel, we can be united, and this too gives me hope. 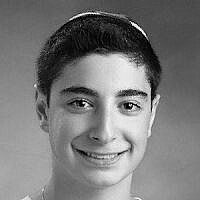 Jeremy is from Toronto and he is a high school student at Tanenbaum CHAT.